Physics Buzz: Particle Accelerators, New Wine Daters? I love wine. Although I tend consume the cheap, boxed variety, a quality vintage always has a home in my glass. It seems French scientists, along with The Antique Wine Company (a London-based wine dealer), have found a new use for particle accelerators. They've developed a method to authenticate wines with a device originally designed to smash atoms at nearly the speed of light. According to the National Centre for Scientific Research (CNRS), the technique determines the age of the glass of wine bottles, by analyzing X-rays emitted when bottles are placed under ion beams produced by a particle accelerator. 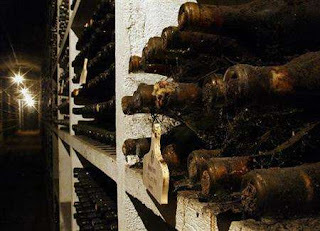 The test is far more comprehensive than current radioactivity tests (performed on the wine itself), which cannot identify vintages prior to 1950. It also appears more convenient, as the test can run without opening the bottle or tainting the wine. Vintage wine bottles are something akin to fingerprints; a mark of the time period they were made in. Distinct ways of manufacturing and production reveal the age of a glass bottle. To determine the vintage of wines in the study, Researchers compared the results with a database containing information on 80 Bordeaux-region bottles from the 19th century to present day.